If you haven’t made your way to the Laguna Art Museum for the Wayne Thiebaud Exhibit, you should definitely do so while you have the chance. I got my chance this weekend, and let me tell you, it was truly a treat (pun intended). Wayne Thiebaud is considered to be a part of the pop art movement (kind of) and is one of the world’s most popular and respected painters. He has a bit of a soft spot for southern California, which is a big reason as to why he ended up in the Laguna Art Museum. 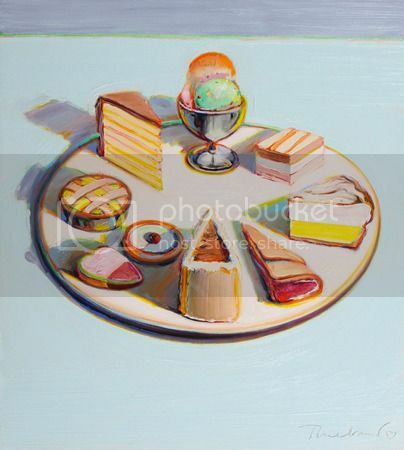 What’s so special about this exhibit is that Mr. Thiebaud himself handpicked the pieces that make up what he calls American Memories. 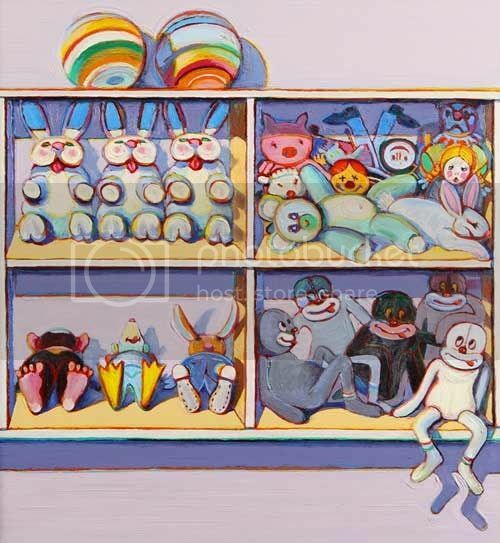 Stuffed Toys Study (2004). 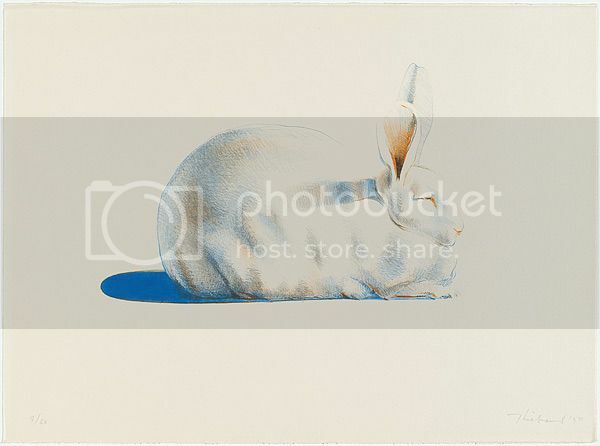 Wayne Thiebaud. Nostalgia is a keyword to this collection. It features many mouthwatering pies, cakes, desserts, and other types of food that are painted with bright colors and globbed on, beautifully textured paint. To add to the nostalgia, there are women featured in different scenes such as a woman lounging in a bath tub that provokes a sense of 1960's juxtaposed, worn out glamour. Hanging close is a woman sitting in a theatre booth painted brightly. His landscapes that he uses to create his own world hang scattered amongst the food and nostalgia. 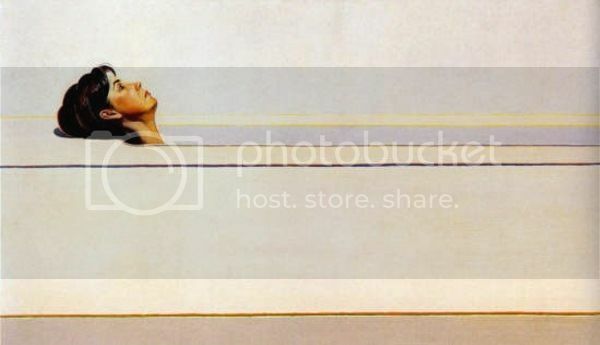 Woman in Tub (1965). 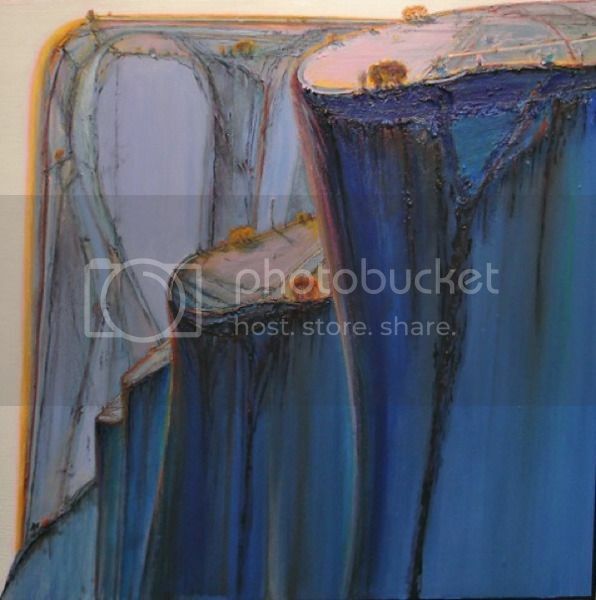 Wayne Thiebaud. What I find most interesting about this exhibit is that when paying attention to the time Thiebaud created each painting, you can catch the feeling of the era in which he was working on the particular painting. The paintings he created in the 80’s feel like an 80’s era painting, same as the 90’s and 70’s. It is apparent that Wayne grew with his times. But this does not mean that he does not retain a style. His style is apparent throughout, which is a style that comes through in color, texture, and the creation of nostalgic worlds. His American Memoriesreally become more like dreams of memories rather than actual memories. But then again, maybe his paintings are asking how closely connected our dreams and memories actually are. All in all I found the show extremely enjoyable. I recommend it to anyone of any age. As Thiebaud himself says, he looks for laughter when people look at his paintings, and that’s exactly what I feel they provoke. Window View Study (1993). 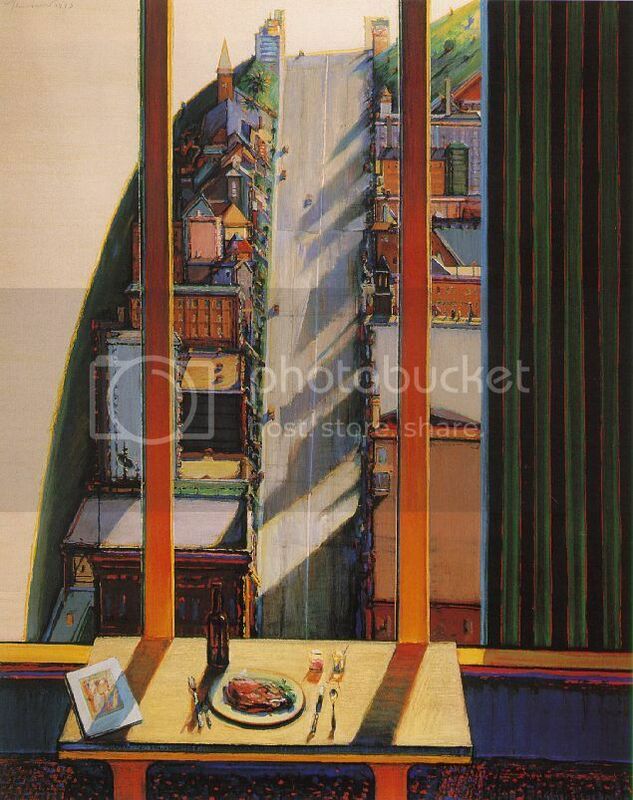 Wayne Thiebaud. Canyon Bluffs (2014). Wayne Thiebaud.